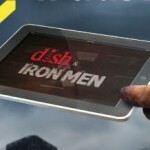 Dish Network is giving away Apple iPads to promote the upcoming new season of Iron Men on The Weather Channel. I don’t know. Is there a connection there? Regardless, the satellite company is selecting two winners each week who submit their name, email and phone number. Contestants can enter daily. And, they have a trivia question which you can answer for a bonus entry. Here’s a link to their Facebook page. Good luck!